Patrick O'Connor & Carrie Budoff Brown, Politico.com: The long-simmering tension between insurers and congressional Democrats is erupting into open warfare, with lawmakers stepping up their push to revoke a key federal protection for the insurance industry. 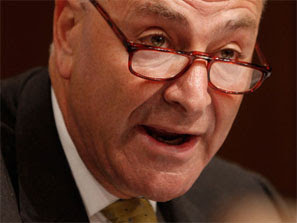 Sen. Chuck Schumer (D-N.Y.) on Wednesday called for an amendment to the health care reform bill that would remove the long-standing antitrust exemption for insurers [LSB: WTF? ], echoing a push by other Democrats to crack down on the industry. “The health insurance’s antitrust exemption is one of the worst accidents of American history," Schumer said. "It deserves a lot of the blame for the huge rise in premiums that has made health insurance so unaffordable. It is time to end this special status and bring true competition to the health insurance industry." Sen. Patrick Leahy, chairman of the Judiciary Committee, introduced a bill last month to remove the anti-trust exemption and convened a hearing Wednesday, where Schumer called for eliminating the exemption as part of the health bill working its way through Congress.